We’ve teamed up with 25th Century Games, another local Atlanta start-up, to bring all of the characters from the Robots Love Ice Cream video game universe to a new card game format suitable for ages 8 and up - making it perfect for family game nights! We are thrilled with the success of the video game version and are excited about transforming these robot characters into a fun card game. 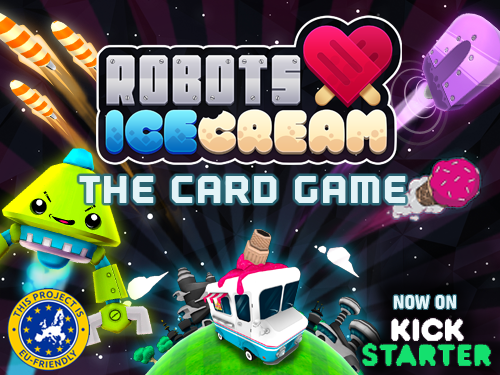 A Kickstarter campaign has been launched to support the production costs of "Robots Love Ice Cream: The Card Game", which is critical to the project. Please consider supporting the initiative on Kickstarter and securing a copy of the card game.